Happy Birthday to your blog! I love stopping by and seeing what you're up to. And I don't mind Play-Doh or unvacuumed carpets. Congratulations on two years of blogging!! I am one of those new readers and I am really enjoying your blog. That whirlygiggle quilt is next on my list after knitted baby blankets for my yet to be born (twins) niece and nephew. Congrats Michelle, and here's to many more! Cutest little robot buttons ever! I love your creative blog! Happy Birthday to your blog!! I love popping in and seeing your crafts. I loved seeing the buttons from last swap. They look like so much fun. Can anyone join or do you have a specific group? Happy 2nd birthday! My baby boy is almost as old as your blog. And I'll bet he'd love a robot button :) I know I don't comment often but I stop by every day and love looking at all of your creations and pics of your adorable girls. Yay!!! Happy 2 and congrats on your sew mama sew fame. Your tute is really great! I am totally excited about your button swap. And please don't enter me in your giveaway. I already own an amazing little robot guy! Hey there: Wow! for blogging for 2 years. I enjoy stopping by and seeing what you are up to. I love the quilt tutorial. Good job! I'll be looking forward to the button swap again. Well, I guess I will delurk to say I want those buttons! I think I might join the swap too--I really enjoyed seeing the last batch that people made. Count me in for robots (the boy and I are big fans)! I love your space here... Congrats on two years! 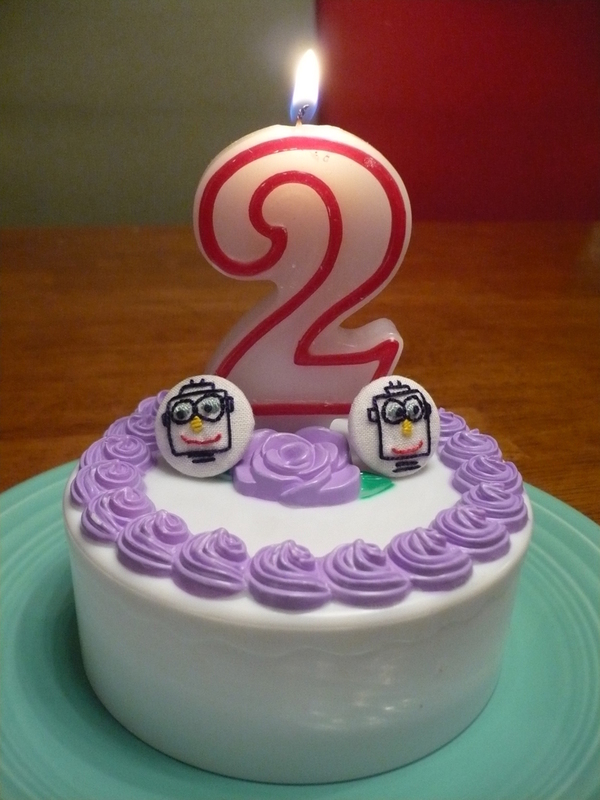 Happy belated 2nd blog birthday! (haha say that 10 times fast and you'll forget all about the playdoh). Happy Birthday!! By the way, I have tagged you for a meme. I apologize if you have already done this one! oooo...today is Sunday!! :) I'll be looking for the swap announcement.